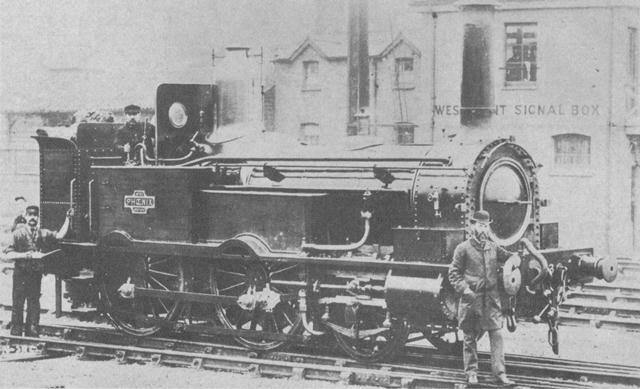 The graceful engine illustrated above gives a good impression of the appearance of the Quainton Beattie as she would have looked when she arrived for service on the London & South Western Railway from the Beyer, Peacock's works in 1874. Phoenix, in our picture, was built in 1872 at the Company's works at Nine Elms and differed from 314 when new by having rather prominent rectangular splashers to the driving wheels and lock up valves on the centre boiler ring. With these exceptions Phoenix and 314 would have looked alike. The livery in those days would have been a rich chocolate colour kept in a beautifully polished condition. The large brass dome and the copper top to the tall chimney would have shone in the sun and all the brass and steel fittings which were not painted would have been burnished brightly. In all its elegance a Beattie well tank would have not been out of place in a Victorian drawing room with the aspidistra and the carved mantelpiece! The adage 'handsome is as handsome does' applied in the case of the well tanks because these lightweight engines, weighing only 33 tons, performed extremely competently and economically in the London area on the commuter trains of the 1880's. The purist might point out that our Beattie would have very little of the 1874 engine in its present day form. This is probably true but what remains is the same genteel Victorian appearance and the same character which has been developed by a century of service.